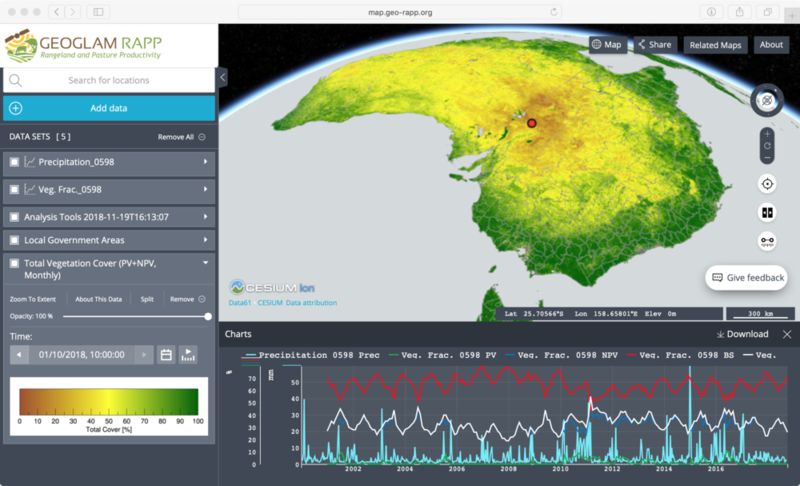 TerriaJS is an innovative open source solution enabling publishers to efficiently get their spatial data on the web, including 3D and 4D data. Assemble catalogues of spatial datasets with a combination of hand curation and live querying of online data services. 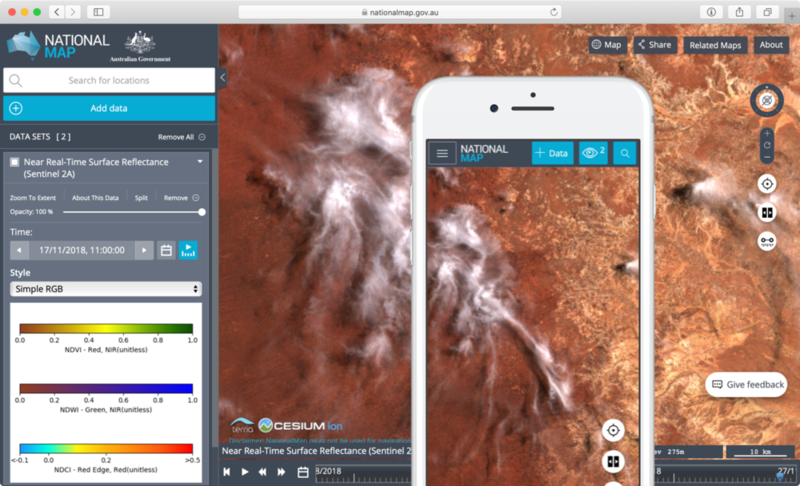 TerriaJS powers world-leading platforms such as Australia's NationalMap and the Australian Renewable Energy Mapping Infrastructure (AREMI), and facilitates the exploration of satellite imagery from Digital Earth Australia. 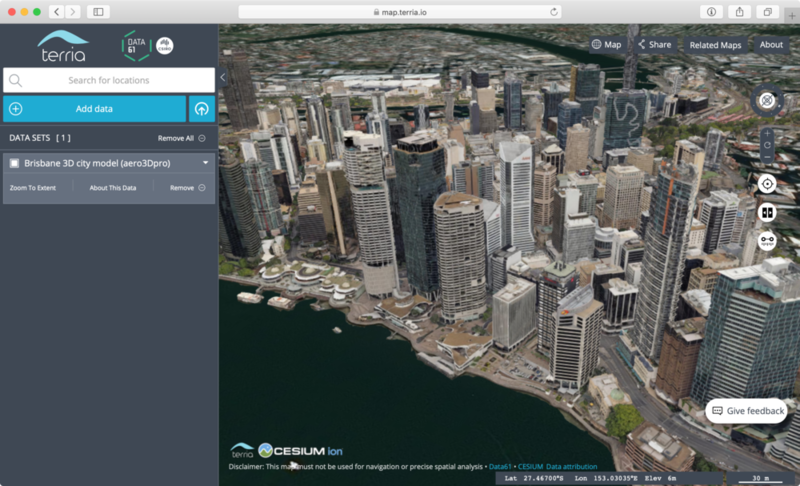 Visualise your data on 3D terrain, fall back to 2D on older systems or switch between them on the fly, based on Cesium and Leaflet. Compare your datasets using the image splitter and date picker. Works best to compare data at different points in time, or different datasets. Easily analyse the underlying data from map features or external sources, using rich and interactive charts, and export the results. Explore time-varying WMS layers, watch vehicles move smoothly across the map and observe your CSV data change over time. Present a dynamic catalogue for existing WMS, ArcGIS, CKAN, CSW, Socrata, WMTS of WFS server, curate the catalogue by hand, or use any combination thereof. 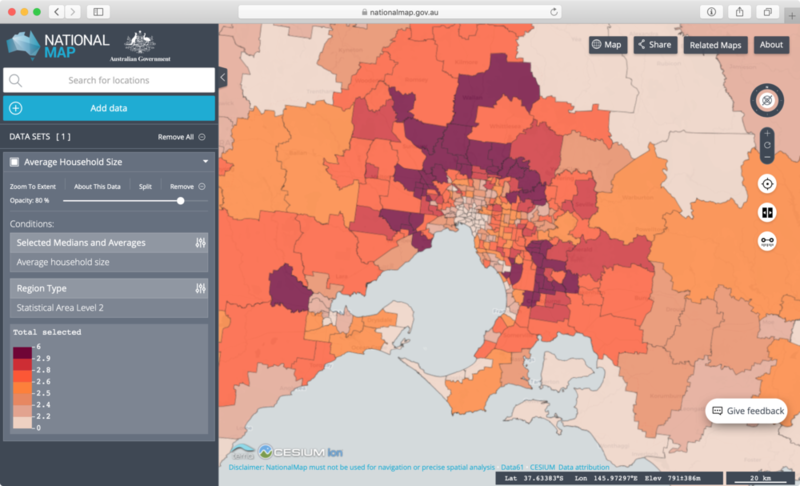 Visualise WMS, WMTS, WFS, KML, GeoJSON, CSV, CZML, GPX, and many more spatial formats out of the box, or easily add your own. Allow your users to specify Web Processing Service (WPS) parameters from the UI and visualise the result in your workbench. Simply drag-and-drop a CSV file of region names and values for TerriaJS to automatically visualise it on the map. Includes a React-based user interface designed and tested by UX professionals to excel on phone, tablet or desktop. 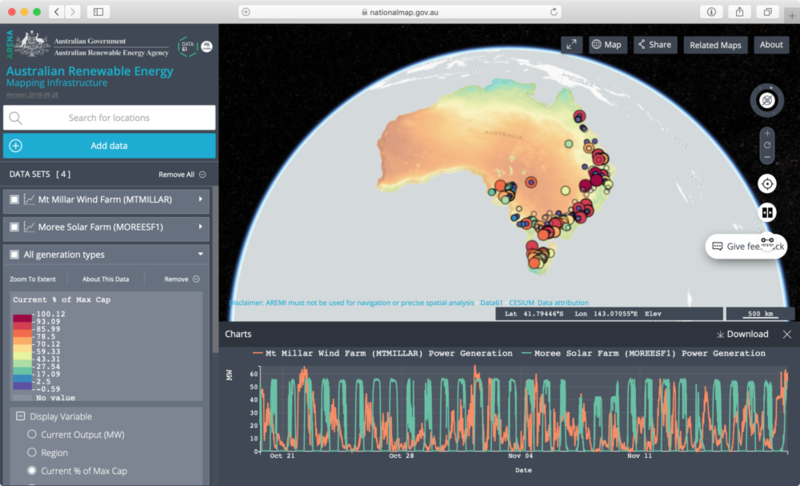 Since 2014, TerriaJS development has been supported by NICTA and CSIRO Data61 in collaboration with Australian Government agencies at all levels, such as Department of Communications, Digital Transformation Agency, Department of Environment, Australian Renewable Energy Agency, Geoscience Australia, Bureau of Meteorology and many others. As a result, TerriaJS powers world leading platforms, such as NationalMap, AREMI (Australian Renewable Energy Mapping Infrastructure), NEII (National Environmental Information Infrastructure), SoE (State of Environment 2016), Northern Australia Map and many others. TerriaJS is a rich library for geospatial visualisation thanks to support from its founding partners and community. You can make it better!